I've actually gotten 2 cards made today before midnight. My Christmas puddings are colored with Copic markers, Liquid Applique for the frosting, glossy accents on the berries, and my favorite holly paper from The Paper Studio. I find myself using a lot of The Paper Studio products. We all have our favorites. Supplies: Green Card Blank 5" X 6 1/2", Papers: The Paper Studio, Stampin Up-Whisper White, Wausau Paper-Metallic Cardstock, red unknown, Stamps: See-D's-#50316-Traditional Christmas, #50315-Fun Christmas, Ink: Stampin Up-Old Olive, Ranger Archival Ink-Jet Black, Copic Markers, Sharpie Poster Paint Pen-gold, White Liquid Applique, Making Memories-Holly brads, Fiskars Shape Cutting template-Circles-1, Sakura Gel Pen-gold, Ranger Glossy Accents, CTMH texture tool, pop dots. Ooooh Beverley - Festive Feasting indeed! Love your puds with their frothy topping. Thank you for rising to our food challenge this week and good luck in the prize draw. Your card is just stunning and gorgeous. 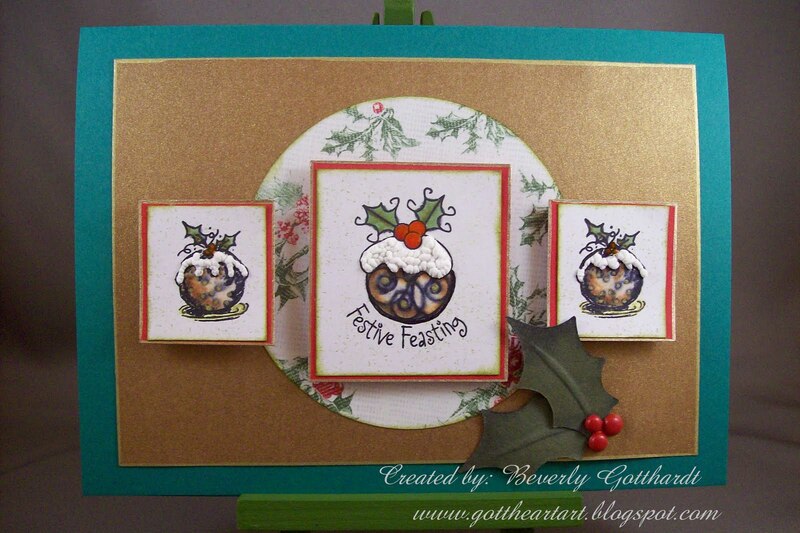 I love the Christmas Puds, and your idea of applique for the topping is fantastic. Your background and holly finish everything perfectly. Thank you so much for joining in with our latest challnge. Fab clean card - love it. The layout works brilliantly. How fun, great coloring and I love the idea of Bah Humbug, have to check that site out. Thanks so much for playing along with my sketch this week! Great card.